Red is the color of life. Where I live, the ground has been frozen and covered with deep snow for months now. Winter is beautiful in so many special ways. I wouldn’t want to live anywhere else. However, about this time in the winter season, I start to crave color. It’s a real thing. Just about mid-February, People here are looking to do anything to create more heat. I think valentines were invented to satisfy this strong need for hot color here in the frozen north. That may not be technically true, but it is how I feel about it. There’s more to the timing of Valentine’s Day than a chance to sell chocolates and flowers. Valentine’s Day infuses a cold season with passion. The cold I am talking about isn’t just the winter temps. Aquarius*, oriented so strongly to airy, intellectual qualities, has a bit of a cold nature too. That isn’t a judgment, just an observation. Valentine’s Day occurs just when we might feel the most detached from life force and when we most need to restore passion and play into our lives. The contrast between cold and hot creates an alchemical reaction—a marriage of opposites, which yields fertile possibilities. We get the opportunity to experience this integration on the Full Moon in Leo this week, which just happens to be on Valentine’s Day (an on a Friday as well!). There is no excuse to hide behind pale colors this week. Embrace the red as you would embrace life itself. Opposite signs give each other permission. Leo, opposite Aquarius, gives that cold and analytical sign, an opportunity to express uncensored passion. Aquarius helps give Leo more gravity (in an odd way for an air sign). Take your passions seriously; they show us where life force needs to go next. Sunday, February 9. Mental energy is strong and challenged. Mercury stationed retrograde on the 6th. With the Moon in Mercury’s home sign, we may notice the difference between ordinary mental states and extraordinary ones. My personal belief is that Mercury retrograde periods are times when we are forced to access our non-dominant thinking strategy. If we tend to appreciate rational logic, then we have to use intuition more. If we prefer intuition, then we have to exercise our logic muscles. Gemini reminds us of polarity and duality and the ways we shift back and forth. Perception is relative. February 10—Gibbous Moon: Perfecting. The nature of this phase of the Moon comes from the relationship between the signs where the Moon and Sun reside. Cancer (Moon) and Aquarius (Sun) offer each other just enough dynamic tension that we are forced to make adjustments. The primary friction comes from the interaction of cardinal water (Cancer) and fixed air (Aquarius). It is too easy for either of these signs to dismiss the other. But when they make room for the other, the potential inherent in this lunar cycle goes way up. Air signs benefit from having a tether to reality and relationships. Otherwise, their inspiration becomes too abstract to be valuable. The Cancer Moon asks Aquarius to anchor to real emotional experiences. This is not a simple process. We need discernment to know when and how to pay attention to feelings, to know when fears are founded and when they are not, and to know when to solve emotional problems or simply let them be. The day starts with an emphasis on our feeling natures. Our dreams the night before may have been vivid and important. By the evening, the tension between emotion and abstract thinking may be the strongest as the Moon squares Uranus and conjoins Jupiter. We win when we make room for heart and mind. Tuesday, February 11. Emotional honesty may be difficult but could also be liberating. By this, I don’t mean emotional dumping on others. Emotional honesty today could take the form of being fully present to our own emotions and taking responsibility for them. This responsibility could mean having an honest conversation, or could be knowing when to keep that information to ourselves. The Sun in transparency-loving Aquarius squares Saturn in shadow-loving Scorpio today. This connection is rich with emotional information seeking a way to transform our world. Your soul is speaking. Wednesday, February 12. The distinction between emotional knowing and intellectual knowing is more pronounced today. Mercury, which stationed retrograde in watery Pisces, reenters Aquarius. With the Moon moving into Leo, a new dynamic is needed. Think red. Think passion and play. If life has been feeling too serious lately, Leo energy provides the release valve. Laughter is healing and enlivens us. Thursday, February 13. Tomorrow’s Full Moon is already felt strongly. The first indication is a feeling of daring to express one’s unique point of view. The Moon in firey Leo trines Uranus (ruler of Aquarius). This aspect encourages self-expression. Life force is strong. Begin to notice how self-expression interacts with collective creativity. This Full Moon is an opportunity to integrate the communal perspective of Aquarius with the personal significance of Leo. The two can seem to battle each other, but there is an opening to find the ways they complement each other. What are you noticing? 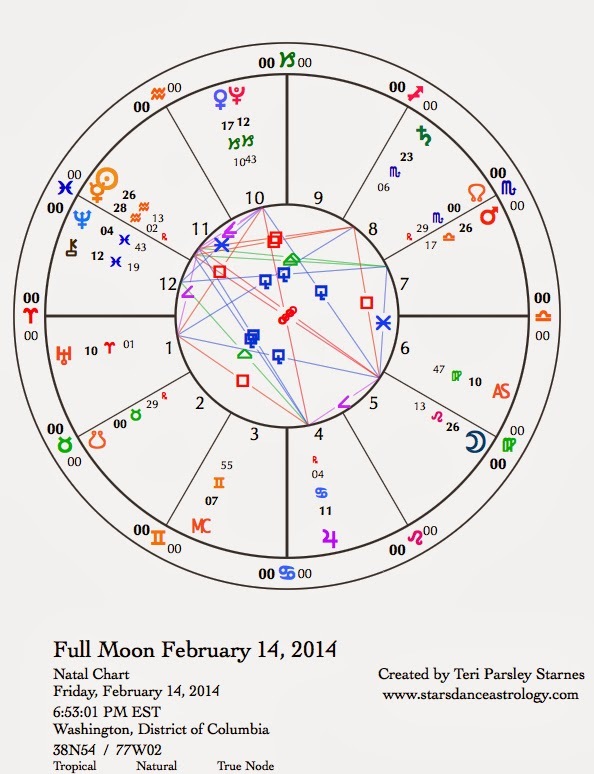 February 14—Full Moon: Illuminating. This will not be a quiet Full Moon—thank goodness! Mid-winter begs for firey expression. The more red, the better [See this week’s introduction]. Perhaps you are noticing the effects of repression. Something’s got to give. Where I live this is known as cabin fever. Where is the romance? How many different forms can romance take? Don’t feel trapped by what is shown on TV. What kindles the flame of you heart? How do you appreciate this flame in others? We all need to be seen for our unique contributions to the whole. What happens when we celebrate ourselves? Two aspect configurations command our attention. One is the dynamic, paradigm challenging aspects between Uranus, Pluto, and Jupiter. This configuration feels a little reckless but also carries a lot of creative potential. The other aspect pattern is the opposition of the Sun in Aquarius and the Moon in Leo forming a square to Saturn in Scorpio. Three of the four fixed signs demand to be integrated. Fixed signs are stewards of their element. Air, Fire and Water are calling to us. Although, no planets currently occupy the fixed earth sign, Taurus, we can’t forget the need for grounded, embodied structures as we attempt to create these new paradigms. Saturn’s influence is felt as greater gravity. Things matter deeply. The stakes are high. Are you up to the challenge? We invite in Aquarian inspiration and Leo creativity to spark the flames of change. May these changes feed the deeper structures of this world. Saturday, February 15. Did you feel the wild release of romance yesterday? Today’s Virgo Moon asks us to pick up the messy pieces of Full Moon exuberance. That is OK. After a release, we can feel a little fragile. Take care of yourself. Virgo brings a desire for healing and integration. The Moon opposing Neptune this morning (CST) gets the day off to a heart-full start. We can be grounded and connected to ever-widening spheres of compassion. Don’t be thrown. The Sun and Mercury retrograde conjoin today. This marks the heart of this Mercury retrograde journey. Unusual illuminations are all around. Pay attention.